THE WORLD'S WORST SUPERHERO TEAM RETURNS IN AN EXPLOSIVE NEW ONGOING SERIES! 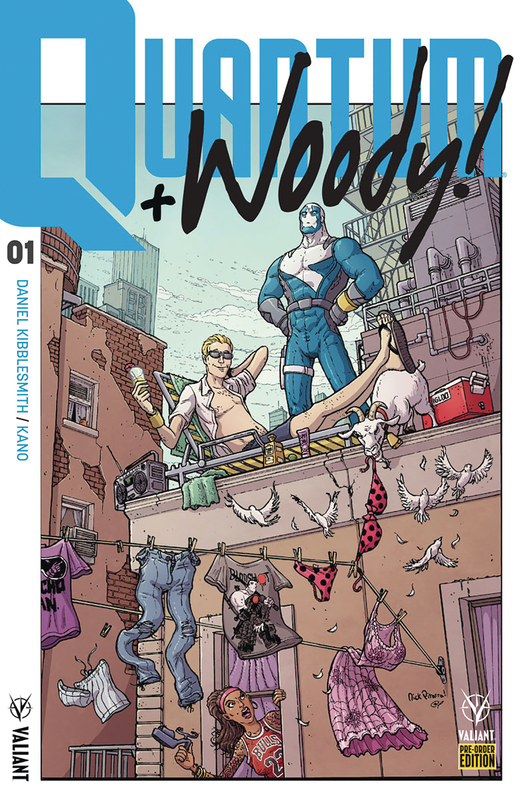 This December, deeply alarming and untrustworthy writer Daniel Kibblesmith (The Late Show with Stephen Colbert) and eyepopping artist Kano (Daredevil) give the Valiant Universe the adjective-worthy superheroes it deserves: QUANTUM AND WOODY! Sometimes?you embrace your destiny. And sometimes?you and your troublemaking adopted brother find yourselves trapped in a scientific lab explosion that grants you $@&%ing awesome superpowers. As a result of their accident, Eric and Woody Henderson - aka Quantum and Woody - must 'klang' their wristbands together every 24 hours or both dissipate into nothingness. Which makes superhero-ing pretty awkward when you're not on speaking terms at the moment. See, Eric has been keeping a pretty big secret: He knows who Woody's birth father really is?and where he's been hiding all these years. With great power comes great sibling rivalry! This winter, you'll believe two men and one goat can split a one bedroom apartment and still be a credible threat to evil and injustice everywhere when QUANTUM AND WOODY make headlines and take names!